नैय्यर साहब को भावभीनी श्रृद्धांजली. आपका आलेख एक संपूर्ण श्रृद्धांजली है इनकी शख्शियत को. मनीष जी, क्या खूब फ्लैश बैक प्रस्तुत किया है आपने! ये सब सदाबहार गीत आज भी उतने ही मनभावन हैं जितने तब थे नैयर साहब को विनम्र श्रृद्धान्जली..
नैयर साहब को हमारी श्रद्धांजलि। सुना है उनको पारम्परिक संगीत की कोई शिक्षा नहीं मिली थी।लेख अच्छा लिखा! 'Yehi woh jagah hai' is one of my all-time favourites.. really melodious. Waqai ek legend ko loose kiya hai iss daur ne...which is irreplaceable! Mujhe onki har geet ko sunkar lagta hai ye acchi hai ya behatar hai...lekin kisi ek nirnay per pahunchana bahut hee mushkil hee nahi asambhav bhi ! Bhagwan oonki atma ko shanti de! Hey, I like this song. I do not know much Hindi, but can understand. Main sirf Ithna kahna chatihu. Do not go calling on gully, gully, find someone. Keep adding more songs. I am going to bookmark you in my site. सुपर्णा मुझे भी यही वो जगह....बेहद पसंद है ! कुछ ऐसा है उस नग्मे में कि मन भावुक हो जाता है उसे सुनने के बाद ! डॉन हाँ , मुश्किल तो है ही ये चुनाव करना । क्योंकि सारे ही कमोबेश अच्छे हैं । अपनी राय देने के लिए शुक्रिया ! Mahesha Welcome to my blog ! 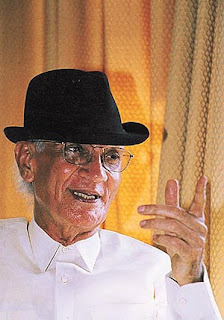 Infact I wrote this post to highlight the work of great composer O. P. Nayyar who died two days back. Pukarta Chala hoon main was his composition sung by Rafi. As for the songs my annual fav song countdown will go up to song no. 25 ,24,23....upto 1 . Hope to see u again.